The Billionty-Oneth Geek: Breaking the day with DAYBREAKERS!!!! Breaking the day with DAYBREAKERS!!!! When the teaser trailer first came out last year, I was quite excited: a world populated by vampires and where humans are an endangered species. The concept intrigued me. There just seemed to be so many cool possibilities. Well, in the end, it was a bit ho-hum. 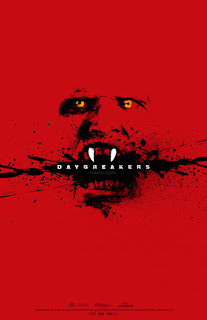 In Daybreakers, we follow a vampire named Edward (and not of the Cullen's) as he seeks out a cure for the vampirism that has consumed the world. He works for an evil big wig vampire named Bromley who I guess is the CEO of the world's largest human blood manufacturer. But conflicts arise because of their different philosophies for the world; one is seeking a cure for the world while the other is seeking for a way to prolong their longevity. Throw in some humans, some action and some blood and guts. Voila. The movie falls into the action/horror genre and when it sticks to the action, it's pretty damn good. With a few exceptions of this random bat that (annoyingly) flies at the screen, there are no scares; it's all based on the gore. The gore is definitely one of the strong suits of this movie. There's a scene near the beginning when the vampire scientists are testing this strain of blood on a volunteer and the results are both hilarious and disgusting. The movie was scribed and helmed by the Spierig Brothers who did the Australian cult favourite zombie movie, Undead, quite a few years back. Of the two, I'd say Undead was better. I guess sometimes working on a limited budget can work in your favour. The single best thing about this movie was Willem Dafoe. From the first moment we hear his voice to the final shot that we see of him, he ruled the whole effin' show. And the Spierig Brothers must have known that he would because they give him all the best one-liners in the movie. Sam Neill plays the evil big wig Bromley. He was great in those few moments when he does get to grace the screen, but the lack of his onscreen time really hurt his sinister factor, otherwise he would have been great. After me and my friends walked out of the theater, we pretty much agreed; the movie was okay, but there was clearly something that kept it from being great. I'm not too sure what it was. Perhaps it was the pacing, a few more action sequences couldn't of hurt. I think weakening Sam Neill as the lead villain also hurt the viewer's connection with the movie. There's a scene near the end when a sub-boss type bad guy tries to steal the glory, and this too did hurt Neill's believability as the main villain. This is a medium recommend. You don't really need to catch it in the theaters but renting it when it comes out on DVD wouldn't hurt. It's a movie that's fun when it knows it is and really slows down when it knows it isn't. Even though there were a few misfires, I still find the concept of a vampire filled world intriguing and I guess that's what's making me give it the moderate thumbs up. Anyhow, that's it for now, later geeks! "Living in a world where vampires are the dominant species is as safe as barebacking a $5 whore."